A wax-free, isophthalic polyester resin used for marine and tooling applications. An industry standard for over 30 years. A wax-free, general-purpose laminating resin. Specially formulated for bonding single or multiple layers of fiberglass cloth, mat, or woven roving to most woods, foams, fiberglass, and metal surfaces. High molecular weight and crosslink density good for corrosion resistance and strength retention at elevated temperatures. Do not use on polystyrene. Do not use in direct sunlight. Working time of mixed resin is approximately 15 minutes. Fiberglass Hawaii MEKP catalyst must be used as a hardening agent. 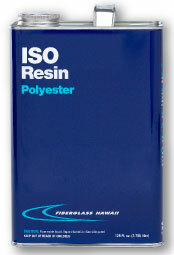 All Fiberglass Hawaii polyester resins are two part systems except for our UV Cure Surfboard Resins. To avoid waste, mix only the volume of resin that can be applied in 10-15 minutes. Using a brush or squeegee, apply resin to surface. After fabric is thoroughly saturated use resin roller or squeegee to remove wrinkles, air bubbles, and any excess resin. This material will remain tacky and is not formulated to be sanded. To sand surface, you must apply Fiberglass Hawaii Surfacing Resin. FDA approved for food &beverage contact, usable in many potable water applications.